The $469 LockState RemoteLock 6i is a "smart lock" that is sold to Airbnb operators through a partnership with the company, allowing Airbnb hosts to generate and expire unique, per-tenant unlock codes. 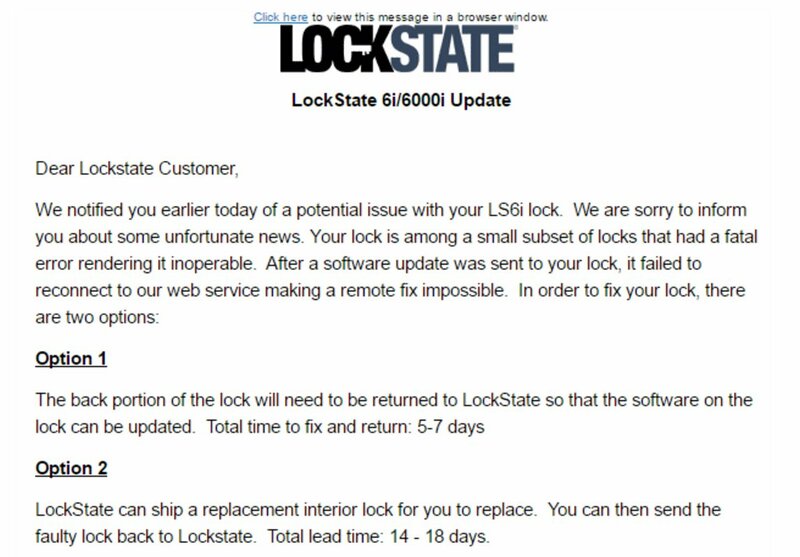 On Aug 8, Lockstate pushed an over-the-air firmware update to its products in the field, and a defect in the update bricked at least 500 locks, causing them to lock down and stay locked. According to a letter sent by Lockstate, there is no way to unbrick the locks now; they have to be returned and replaced. The company is asking customers to send in their affected locks so engineers could update the device with the proper software. LockState estimates that the total time to fix and return the product will be around 5 to 7 days. Customers can also choose to have the product replaced altogether, but LockState says this will take between 14 to 18 days.